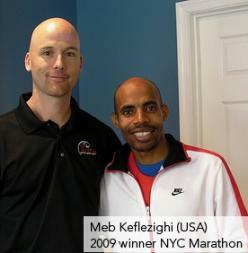 1st accredited specialized Running clinic in USA. Staff includes Active Release Techniques instructor and Titleist Performance Institute level 3 medical certified provider. We focus on finding the cause of running injuries rather than only treating the site of pain.We do this with functional movement screening and comprehensive gait analysis.We also treat the injured area with dry needling, Active Release Techniques, chiropractic and rehab. Running specialty clinic focused on finding the cause of running injuries rather than only treating the site of pain. We do this with functional movement screening and gait analysis. Both clinicians are runners and have competed in many marathons, half marathons and full Ironman triathlons. Dr. Maggs was the Active Release Techniques director for all Rev3 triathlons from 2009-2013.